CBDM of city models: A proxy means to determine measures of the UHI effect? Climate-based daylight modelling (CBDM) was originally conceived as a means to predict realistic measures of daylight in buildings. The simulation approach proved to be highly scaleable and CBDM has found applicability for a wide range of urban design issues operating across all relevant architectural scales from individual window details to entire 3D city models. Extensive Radiance simulations were used to assist the building owner and manufacturers in making informed decisions on the design and control of an automated roller shade and electric lighting control system for The New York Times Headquarters in the pre- and post-bid phases of the project . A prior monitored field study in a full-scale mockup answered initial questions concerning technical feasibility and performance benefits of automated control. Simulations enabled extension of the monitored field study to the final building in its complex urban context. CBDM simulations were used for a variety of purposes, from understanding the effects of urban shadow on shade useage to assisting with pre-calibration of photosensor sensitivity in a complex daylit interior environment. Full year climate-based simulations were conducted to more thoroughly assess daylight provision, comfort conditions and availability of view (defined as shade raised), and their complex inter-relations. A detailed 3D model of one floor of NYT office-space was created and this was located at the appropriate height in an envelope model of the tower. The external brise-soleil - which consists of distinctive ceramic bars - was modelled in detail for the target floor, and also one floor above and below to ensure that light transfer from all directions was accounted for. The 3D model of the surrounding context was much more detailed than required. However, it was found to be far easier - and quicker - to work directly with this model than to attempt to reduce the detail (and therefore polygon count) using, say, mesh simplification techniques. 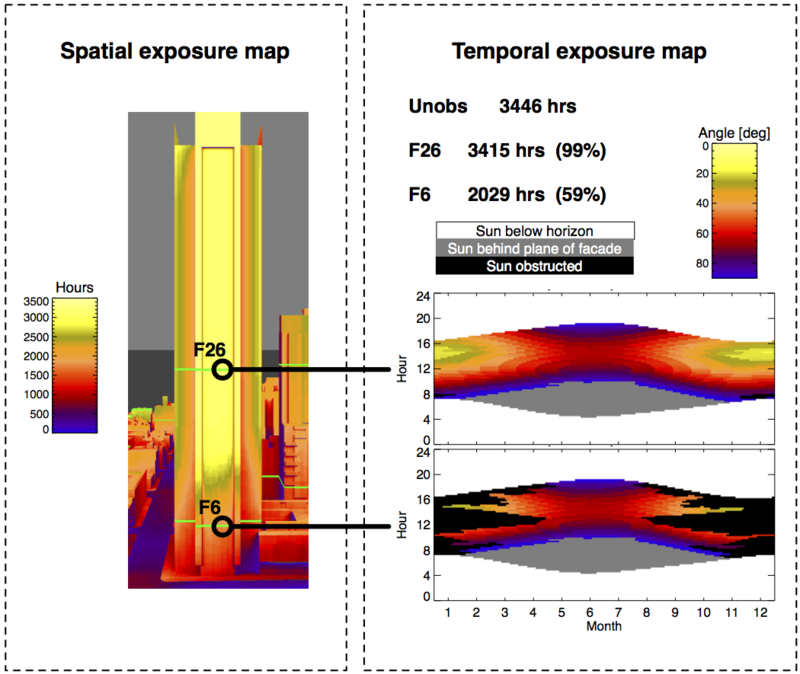 The prevailing sun exposure was determined using a combination of spatial and temporal sun exposure maps. Non-domestic buildings in cities are a major consumer of energy. Of the mature technologies that have been recently deployed to reduce the primary energy consumption of buildings, the in-situ generation of electricity by photovoltaics (PVs) is under consideration. A report by the UK Department of Trade and Industry gives details of 16 typical building integrated photovoltaic (BIPV) projects . For these demonstration projects - recently completed, planned or speculative - open sites with minimal nearby obstructions were the norm. In the medium-to-long-term however, BIPV for typical office buildings will need to be considered since this is where the majority of the energy use takes place. In addition to offsetting primary energy demand, it is recognised that there is significant potential to reduce the electrical consumption in offices through the effective use of daylight . At present, however the use of daylight in office buildings is considered a greatly under-exploited resource. In large part this is because the highly variable nature of daylight illumination often produces extremes of over-provision of illuminance that are difficult to temper to moderate levels using conventional methods. For example, when blinds are lowered in response to high levels of illuminance and/or glare, there is usually little attempt to tune to the slat angle to achieve some optimum between shading efficacy and daylight provision. The lowering of blinds when illuminances are perceived to be excessive is often accompanied by the switching on of electric lights (if they are not on already). In contrast to the ‘shutter mode’ of operation for standard blinds, a glazing with a transmissivity that varies continuously between clear and dark extremes would offer a much greater degree of control over the luminous environment. Indeed, the dynamic control of daylight has been termed the “Holy Grail of the fenestration industry” . In principle, the approach is simple: the transmission properties of the glazing are varied to achieve the best possible luminous environment. Formulations based on electrochromic (EC) principles, where the glazing transmission is modulated by a small applied voltage, were considered the most promising. In practice however, the formulation and production of commercial-sized EC glazing has proved a formidable task, and the technology is only now coming to the market. Some very recent developments in digital-on-demand printing technology have culminated in a revolutionary window film called SolaVeil . Applied on the inside of existing glazing, SolaVeil combines high levels of heat rejection with light redirection properties. Initial installations of SolaVeil have proven that it has great promise as a ready-for-market energy-reduction technology. Whatever the formulation, BIPV, EC, Solaveil, etc., a key consideration at the strategic level is the large-scale potential for the deployment of the various solar-dependent retrofit technologies. This requires a means of surveying the facade areas of large collections of buildings and grading them according to the incident irradiation. The example presented shows how these quantities can be estimated for highly detailed 3D city models using a view-dependent solution. Is there a trade-off between the disadvantage in not being able to account for long-wave thermal exchange and the advantage in modelling short-wave radiation exchange using the full geometrical complexity of a 3D city model? Following on, another key question arises: is it possible to infer the propensity for radiation trapping - a factor in urban heat island effect - from CBDM of entire 3D city models? This image was exhibited at the Louisiana Museum of Modern Art, Denmark in 2009. DTI. Photovoltaics in Buildings: BIPV Projects Programme - Strategy Document 1998-2002. Technical report, Dept. of Trade and Industry, 2000. V. Crisp, P. Littlefair, I. Cooper, and G. T. McKennan. Daylighting as a passive solar energy option: An assessment of its potential in non-domestic buildings. Building Research Establishment Report, Garston, CRC, 1988. S. Selkowitz and E.S. Lee. Advanced fenestration systems for improved daylight performance. Daylighting ’98 Conference Proceedings Ottawa, Ontario, Canada, 1998. J. Mardaljevic and G. M. Janes. 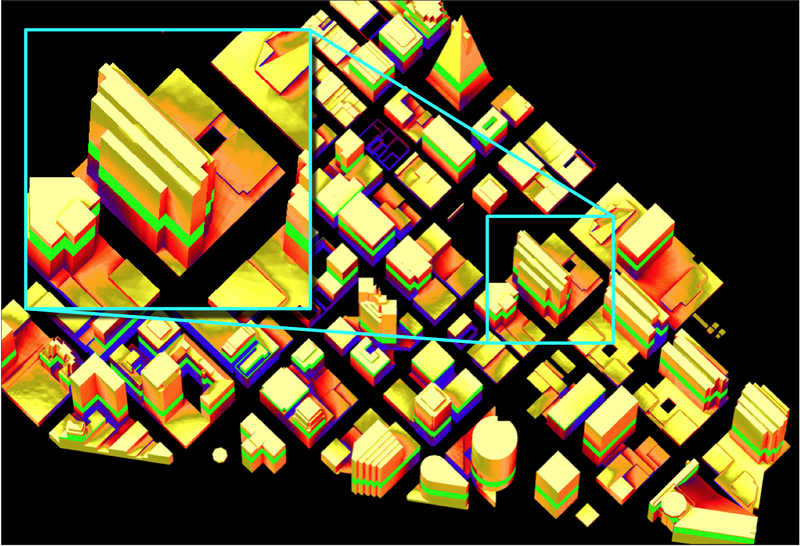 Solar Energy at Urban Scale, chapter Multi-Scale Daylight Modeling For Urban Environments. John Wiley and Sons, Inc., 2012.